The purpose of this fundraiser is to provide clean water where it is most needed. According to research from the United Nations, 20% of the world's population lacks access to clean drinking water on a daily basis. 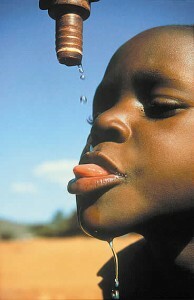 85% of all diseases in African children under the age of five are caused by water born illnesses. There are approximately 30,000 children die daily from contaminated water. Technology has been developed to eradicate such struggle, and you can all do something about it. We have the power to give up our beverages with water and assemble enough money for this cause.